A white board for college will do you no good unless you have some dry erase markers to go with it. Actually, you'll probably need more than just a few markers—you'll want some backups for when you inevitably lose a couple markers or one runs dry. 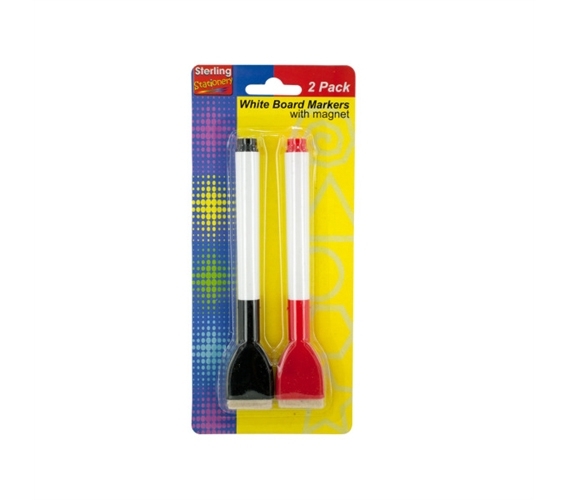 So, include these Dry Erase Markers with Magnet (2 Pack) with your college stuff if you'll have any type of college dry erase board in your dorm room. They're cheap dorm stuff, meaning you can buy a few sets just to keep for extras. These markers for whiteboards have handy eraser caps. After all, that big whiteboard eraser is just one more thing to lose! The markers are also magnetic; you can slap them right on that college mini fridge. By keeping your markers stuck on your dorm mini-fridge, you'll be less inclined to lose them. Yes, they're cheap dorm items, but it's still annoying to have to replace lost markers—stock up now with this Dry Erase Markers with Magnet (2 Pack).